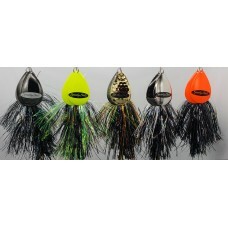 The Lake Pack page contains packs of proven colored Fireballs for your favorite lakes. Save money as each packs contain 5 baits and sell for less than if purchased individually. More packs will be added as baits are tested and proven. These lures have a crazy action and attract fish in a big way. The vibration of the magnum blades along with the visual addiction of the Flashabou makes this a lure that will go down in history. All this lure does is catch monster fish!